Lake Tahoe is one of the premier recreational spots in the United States of America. Stretching out over the state border between California and Nevada, this freshwater lake is the biggest alpine lake in all of North America and is second only to the Great Lakes in terms of volume. It's also the second deepest lake in the United States and has an exceptionally long shore length of around 71 miles. One of the best things about Lake Tahoe is that, due to its location in California and Nevada, it enjoys some great weather through large parts of the year, with plenty of sunshine and warm temperatures offering idyllic conditions for a lot of fun outdoor activities like water sports, sunbathing, swimming, kayaking, hiking, bicycling, and more. It's also a fun winter sports location, with lots of major ski areas all around Tahoe like Heavenly Mountain Resort, Alpine Meadows, Kirkwood Mountain Resort and Sugar Bowl Ski Resort. If you're planning a trip to Lake Tahoe and want to make the most of the experience, a boat cruise on the lake needs to be on your agenda. Actually getting on the water and admiring the scenery all around you from the comfort of a boat is a fantastic way to experience this wonderful lake and make some magical memories you’ll never forget. There's no better way to enjoy Lake Tahoe than to actually head out on the water and cruise along the coastline, admiring the stunning views in every direction. Various cruise tours are in operation all around Lake Tahoe, with many different routes to be enjoyed and lots of cruise boats to try out. Each Lake Tahoe cruise has its own advantages and features. Read on to learn some key details about the very best options for cruises on Lake Tahoe. Operated at the Hyatt at North Lake Tahoe and run by Action Water Sports, the Sierra Cloud is a 55-foot cruise ship that runs two-hour tours along the north and east coastlines of Lake Tahoe. This part of the lake is generally quieter and calmer than the resort-laden southern shorelines, so it's a nice place to visit if you want to appreciate the beauty of Lake Tahoe in total peace and quiet. The Sierra Cloud runs cruises of Lake Tahoe at sunset as well as early morning cruises with fresh breakfast treats served on board. If you're looking for a South Lake Tahoe cruise, the Tahoe Queen is the vessel for you. 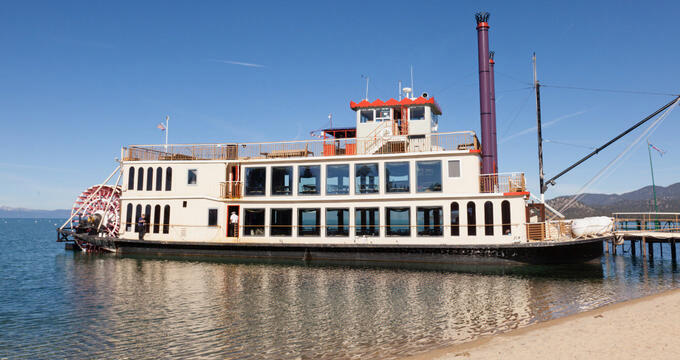 Rated as one of the best Lake Tahoe cruises of them all, this old-fashioned paddleboat can carry over 300 passengers and is the only authentic paddle wheeler to be in operation on Lake Tahoe. The Tahoe Queen therefore offers a thoroughly unique experience and leaves from Zephyr Cove Resort for a 2-3 hour excursion. The MS Dixie II is the biggest cruise boat in operation on Lake Tahoe. It can support a grand total of 520 passengers in total and has been ranked by experts as one of the best cruise experiences in all of California. The MS Dixie II, like the Tahoe Queen, sets off from Zephyr Cove Resort for a two and a half hour journey along the shores of South Lake Tahoe. Owned and run by Tahoe Cruises and also launching from Zephyr Cove Resort, the Woodwind II is a much smaller vessel than either the MS Dixie II or Tahoe Queen, carrying a maximum of around 50 passengers and offering a calmer and more intimate experience that couples or solo travelers should appreciate. The Woodwind II is equipped with some great features like a cozy salon and fully-equipped bar, so it's a fun place to spend a few hours. The Rum Runner Cruise is one of the latest and greatest additions to the Lake Tahoe cruise scene. It's a yacht that measures up at over 50 feet in length and features an expansive outdoor viewing deck granting unbeatable panoramic views of Lake Tahoe and its surrounding scenery. It's a beautiful little vessel and due to its small size, it can get quite close to the shoreline and offer some fun wildlife spotting opportunities too. Up on the northern shore of Lake Tahoe, the Wild Goose II is a 36-foot vessel operating out of Homewood. For small group and family cruises of Lake Tahoe, this is a great vessel to choose as it only holds a dozen passengers, so you're guaranteed a quiet, calm, intimate experience without any crowding or noise.